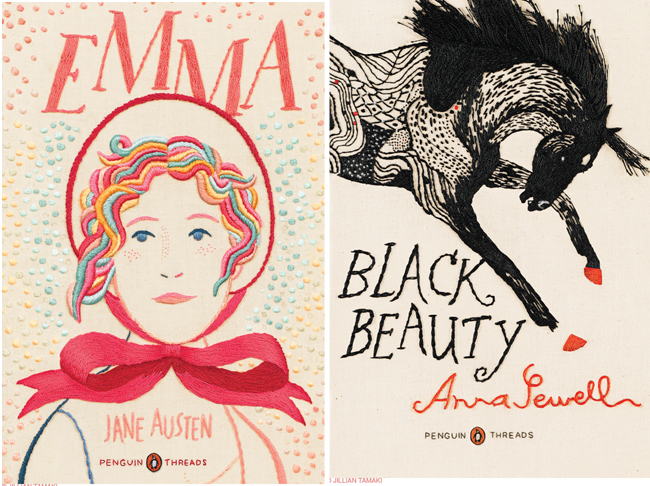 Jillian Tamaki's hand-embroidered covers for the Penguin Deluxe Classics "Penguin Threads" range melt my heart! The artist was commisioned by Penguin to create three covers for classic books: Jane Austen's Emma, Anna Sewll's Black Beauty and Frances Hodgson Burnett's Secret Garden (click each book title to view a full size image of Jillian's cover, front and back!). These gorgeous editions are out in October 2011, but if you can't wait until then be sure to check out Jillian's blog post on the process she went through in making the covers. Which classic book cover would you like to see given the embroidered treatment? Turn it to 11 and sit on it!